When you need ice, call Old Town Newhall Ice Company. We’re the best source for crushed ice, block ice, ice cubes, and dry ice in the Valencia area. You can stop by our Newhall location to pick up a small order of ice, or have us deliver a bulk ice order anywhere in Valencia, Saugus, Acton, Agua Dulce, or Canyon Country. We can meet nearly any special event ice need, from blowing in ice to create a winter wonderland, to carving a crystal clear block of ice into a breathtaking ice sculpture, centerpiece, or bar. With our large local ice inventory, central location, and highly experienced staff, we’re ready to handle ice orders of nearly any size in and near Valencia. Old Town Newhall Ice Company is one of the Santa Clarita Valley’s oldest ice companies. 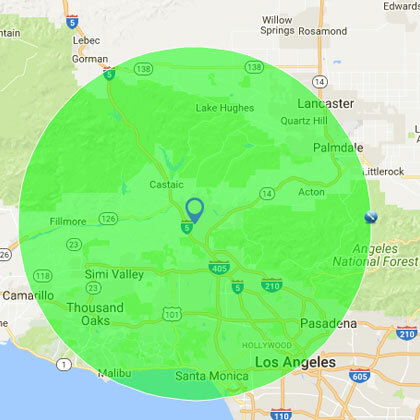 We’ve been locally and family owned since 1906 and have tens of thousands of satisfied customers throughout Valencia, Santa Clarita, Newhall, Saugus, Acton, Agua Dulce, Canyon Country, and surrounding areas. Having served the local area for several decades, we understand the needs of our customers and how to meet them. As a result, our clients know that they can count on us for high quality ice products, competitive prices, and exceptional service. We operate 7 days a week, including holidays, and can respond to most emergency ice requests within 2 hours, no matter the time of day. Call today and let us know about your ice needs. We have ice for every occasion! Old Town Newhall Ice Company sells bags of cubed ice in 7-pound, 20-pound, and 40-pound sizes, and crushed ice in 40-pound bags. Our bagged ice meets the high standards set by the International Packaged Ice Association (IPIA). IPIA ice tastes deliciously clean and fresh because it is made from water of the highest purity. Block ice is sold in 25-pound increments, up to 300 pounds. Our block ice can be used in snow cones and for situations where you need ice to last a longer than a bags of cubed ice. We also sell crystal clear Clinebell ice blocks, which are perfect for carving ice sculptures. Our dry ice is sold in 10 lb. blocks measuring 10” x 10” x 2” thick. Customers in and near Valencia, Saugus, Acton, Agua Dulce, and Canyon Country use it for special effects, such as fog for a movie set or a haunted house; to shrink metal; and to keep a refrigerator or ice chest cold. Old Town Newhall Ice creates one-of-a-kind ice sculptures, such as centerpieces, company logos, ice bars, booze luges, and products-in-ice, for corporate parties, weddings, and other special events in Valencia and other cities throughout the Santa Clarita Valley. We have talented sculptors who can carve your sculpture using chisels, chainsaws, and/or a CNC machine to realize your vision. Ice sculptures are crafted out of 300-pound, crystal clear blocks of ice and delivered on site on the day of your event. We also offer specialty ice cubes, like ice spheres, which are great for cocktails. Snow Services for Valencia Parties, Events, Sled Runs, Filming & More! Call Old Town Newhall Ice Company when you want to make it snow in Valencia! We can blow in tons of fresh snow anywhere in or near Valencia to turn any space into a winter wonderland. Our team can do everything from covering a yard and hay bales with snow in order to create a snow play area and ramps for sledding, to working with a special effects team to transform a set into a snowy scene. Call Old Town Newhall Ice Company to schedule our snow ice delivery service for your upcoming birthday party, holiday party, community gathering, or other special event in Valencia. Consultations are free.